De Beers has made several allegations about Survival in its media release of 5 July. In spite of this, Survival will continue its campaign until the Bushmen are allowed to return to their ancestral lands in the Central Kalahari Game Reserve (CKGR) in Botswana. Bushmen have recently been tortured there for hunting and the Botswana government's violation of Bushman rights remain at an acute level. The De Beers managing director in Botswana welcomed the evictions in 2002 and De Beers continues to attack the CKGR Bushmen by claiming they hunt from vehicles with 'high-velocity rifles'. This is not true. The fact that they do not use firearms or vehicles to hunt has now been admitted in court by the former director of the wildlife department. De Beers also claims that there were no Bushmen in its CKGR mining concession at Gope, where – as it has made clear to Survival – it hopes to mine one day. Gope is in fact on the ancestral land of the Bushmen and they were there when De Beers arrived, a fact confirmed in De Beers's own surveys. De Beers is reportedly working on a policy concerning the rights of indigenous peoples. However it told Survival in 2002 that it does not think that indigenous rights should be applied in Africa. It cited four anthropologists it claimed supported this position. But one, Prof Ingold of Aberdeen University, said that he did not recognise the views De Beers attributed to him. Another of the four was De Beers's own consultant, Dr James Suzman, who believes there is no place for indigenous rights in Africa. Survival has no wish to undermine the Botswana economy as De Beers alleges. We are calling for a boycott of De Beers in order to put pressure on the company and the government (they are 'Siamese twins' according to the country's president) to respect Bushman rights. The vast majority of Botswana's people has not profited significantly from Botswana's wealth. Although the country has had one of the world's highest growth rates since diamonds were discovered there in the 1960s, half the population still lives below the poverty line despite belonging to one of Africa's richest countries. The propaganda, vigorously promoted by De Beers, that Botswana is a shining example of African democracy is also false. Contrary to De Beers's claims, Survival has not prevented dialogue between local NGOs and government in Botswana. De Beers lists four organisations which it claims, 'believe that diamonds have played no role in the evictions.' These are: 1) the Kuru family of organisations; 2) the Working Group of Indigenous Minorities in Southern Africa (WIMSA); 3) the Kalahari Peoples Fund and; 4) Ditshwanelo, the Botswana Centre for Human rights. 1) The Kuru family of organisations, which grew out of the local Dutch Reformed Church mission, is currently negotiating with De Beers to receive several million dollars. 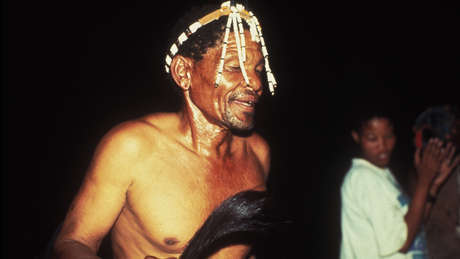 It plays no role with the Bushmen of the CKGR. We believe its funding has engendered a conflict of interests. 3) The Kalahari Peoples Fund has not said that diamonds have played no role in the evictions. Its view is that diamonds is one of several factors. 4) Ditshwanelo, the Botswana Centre for Human Rights, has been funded by several European governments to negotiate with the Botswana government over the CKGR issue. It is run by the daughter of an ex-minister for mines and a special adviser to the president, a man who is also a director of a diamond exploration company with concessions inside the CKGR. Survival believes it too has a conflict of interests.